It’s true; we gardeners love our bulbs and blooms, but when we’re thinking summertime, we’re often thinking of that first bite into a sun-kissed July tomato. The juice, the texture, the flavor! Sliced onto that grilled hamburger at the backyard barbecue, tossed into a crisp salad, or simply canned to enjoy a bit of summer in the wintertime, a great tomato has no equal in the vegetable garden. However, many of us also remember our first forays into growing tomatoes. Grainy tomatoes? Yes, that too. Most tomato problems are preventable, and with the right preparation, you too will be the most popular person in the neighborhood at harvest time. Here are six steps to growing a great tomato. Know your soil. Plants need three things: sunlight, water, and soil. The first two you have limited control over. But the third, soil, is undoubtedly the most important factor in a successful garden, and is entirely under your command. Take a good look at your garden area. Is it clay? Sand? Even worse, rock? If you’ve never improved the soil, taking a sample to your county extension office can be an invaluable source of information, and they will give you the dirt on your dirt. Also, ask your locally-owned nursery for advice. They’ve most likely been in the area for years, and often can be a gold mine of tips and tricks. Watch your budget, though; it’s easy to stock up on soil amendments you may not need. And remember to bring that soil sample with you. You may have vastly different dirt than the neighbor up the road. But the best thing you can do for any garden, overall, is to add quality compost. Tomatoes love a deep, rich soil, and have some of the biggest root systems of any garden plant, often growing roots nine feet or more. Adding organic matter deep into the garden will make for a healthy plant. Not all compost mixes are of the same quality, however, so do your homework. A dry, hard compost with large chunks of decomposing bark or wood does not have the same value a soft, dark compost will. You can even save money and be a bit greener by making your own compost. There are many resources and methods; check with your extension office or at the library. It’s easier than you think! Here’s a tip: save your eggshells, and crumble them into your garden. The extra calcium helps prevent blossom end rot, and can keep your tomatoes at their best. You say tomato, I say, “Which variety?” When you shop for tomato varieties, your choices may be limited by the stock at the nursery. However, there are many, many tomato varieties out there, and you may be lucky enough to run across a great one. When choosing your variety, there are three basic things to look for: type, variety, and growing habit. A tomato is usually either a paste tomato or an eating/salad tomato. Paste tomatoes, like Romas, have a firmer flesh and are better for cooking. An eating or salad tomato is juicier, and are best fresh. Eating tomatoes include cherry tomatoes and large slicing tomatoes like the Beefsteak variety. 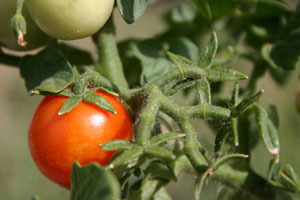 Second comes the variety or name of the tomato. Tomato variety is like the breed of a dog; there are big ones, small ones, even varieties of different colors. Varieties are named, and often build on names of their predecessors. For instance, Big Boy is a common red eating tomato with a good flavor. A later variety was named Better Boy, and yet another, which ripened earlier in the season, was named Early Girl. There is even a wonderful large eating tomato named Mortgage Lifter, because, according to legend, its sales popularity helped the farmer pay off his home! If you have a certain variety in mind, like the Cherokee Purple tomato (yes, it’s a deep purple), it may be easier to find the seed than the plant itself. The variety does affect the flavor and hardiness of the plant, so choose one that suits your needs. Third is the growing habit of the plant itself. When you finally settle on a variety of tomato (or two, or three), you’ll notice on the plant tag a long word slipped into the description: determinate or indeterminate. Determinate plants are more compact and grow to a certain height, usually around four feet. They are a bushier plant, and don’t require much support, which means they are better for small areas or even containers. The tomatoes on a determinate plant will normally all ripen over a week or two, which can make for some frantic canning sessions. This variety includes Romas. Indeterminate plants are those that like to vine, spread, and vine higher. These plants normally grow around six feet, and you may have blossoms and ripening fruit at the same time, which will continue throughout the growing season. The growing habit of many tomatoes, including Big Boy, Early Girl, and most cherry tomatoes, indeterminate plants are the reason the nursery sells tomato cages. The cages should be placed right after you plant the tomato and anchored well, or you might come into the garden one day to find your tomatoes have staged a takeover! Plant it deep. As you’ve read above, tomatoes have deep, fibrous root systems. Once you’ve prepared your soil and chosen your variety, you need to give your new plant a good start. And you do this by stripping the poor thing of quite a few leaves. Sounds harsh? It may seem so, but by trimming the leaves off the bottom half to two-thirds of a good-sized nursery plant and planting deep (yes, cover that stem right up, to just below the remaining leaves), you encourage the plant to start growing roots all along that stem. Mulch well after planting, and you’ll be rewarded with many more roots. More roots means more nutrients for your plant, which means more delicious tomatoes for you. And that root system will also allow your plants access to below-ground moisture, which brings us to watering tomatoes. With watering, sometimes less is more. Tomatoes need a steady, even supply of moisture, especially early in the growing season. This doesn’t mean to water your established plants daily, unless your weather is unseasonably warm and dry. With their deep roots, tomatoes prefer a deep watering once or twice a week. This is often best done with slow watering over a long period of time, even hours. A soaker hose or drip system is great for watering tomatoes and will also keep water off the leaves, which helps prevent leaf scalding and powdery mildew. If the plant receives uneven watering, your tomatoes will crack under the pressure, literally: the fruit will form splits and cracks as it grows. A deep mulch will help keep that moisture in the soil, which helps with the next tip: slow down the watering after fruit has set. As the season heats up, you ease up. If your tomato plants show signs of wilting or stress, begin watering again. Find that happy medium. Those plants, if cared for correctly, have surprisingly deep roots. If they are given too much water later in the season, the tomatoes can become mushy or grainy. Amazingly, many tomato farmers practice dry-farming. Dry-farming cuts off supplemental water entirely after the fruit has set. And the tomatoes are delicious! Expect the unexpected. There will come a day when you reach for that sun-ripened tomato and find a fat, bright green hornworm has taken up residence. Or that your blossoms have begun to fall off, with no baby tomato in sight. There are solutions to some problems, but not all. Here are the basic pests and diseases, and ways to prevent the worst of them. Tomato pests include the tomato hornworm, grasshoppers, aphids, mites, and many varieties of beetle. The hornworm is the larvae of either the Hawkmoth or the Sphinx moth. The more daring gardener will simply pluck them from the plant bare-handed, which is going above the call of duty. Feel free to use gloves. Grasshoppers, beetles, and many other pests are more difficult to control. Keep your garden clear of weeds and other plants that may harbor these unwelcome guests. Insecticidal soaps are useful here, but beware of harming beneficial insects like lacewing larvae and ladybugs that are grazing on your aphids; not all bugs are bad! Again, your county extension office can identify your particular nemesis, and offer specific advice. If you choose to use a chemical control, be sure to read the directions carefully, as many are not recommended for the vegetable garden. Those controls that are labeled as safe for your veggies often have restrictions on when you may use them. Another common problem is blossom end rot, an unpleasant-looking condition. At the blossom end of the green fruit, a small, bruised area will appear. As the fruit grows larger, so does the problem area, changing from brown to black. It becomes leathery. And it is not a disease; blossom-end rot occurs from a lack of calcium in the soil. It can affect other plants as well, and, unfortunately, there is no quick fix. When preparing your soil, add bone meal or another calcium source. Don’t over water or over fertilize. Add compost and mulch around your plants. Last comes blossom drop. The plant blooms, but no fruit appears, and the blossom dies, along with your hopes for that big bite of summer tomato. Again, unfortunately, there isn’t a quick fix for this. Temperature extremes cause the pollen to deteriorate, and no pollination occurs. No pollination, no fruit. Once the temperatures stabilize, your blooms may return, but you may consider planting earlier next season if your summer temperatures are usually high (above 90 degrees or so). If temperatures are too low, below 55 degrees, you may offer some protection from cold by covering your plants. Check out this page on common tomato plant diseases for more information. This is a brief guide to a delicious harvest. Nothing says summer quite like a ripe tomato, still warm from the garden. With a little tender care (and yes, a little loving neglect at watering time), you will have the most delicious tomato on the block. Just watch out for neighbors that become suddenly friendly at harvest time. Although, you could plant some zucchini.